Remaining wide-eyed in a place that thrives on cynicism, Maine's independent senator makes an impression on both sides of the aisle. 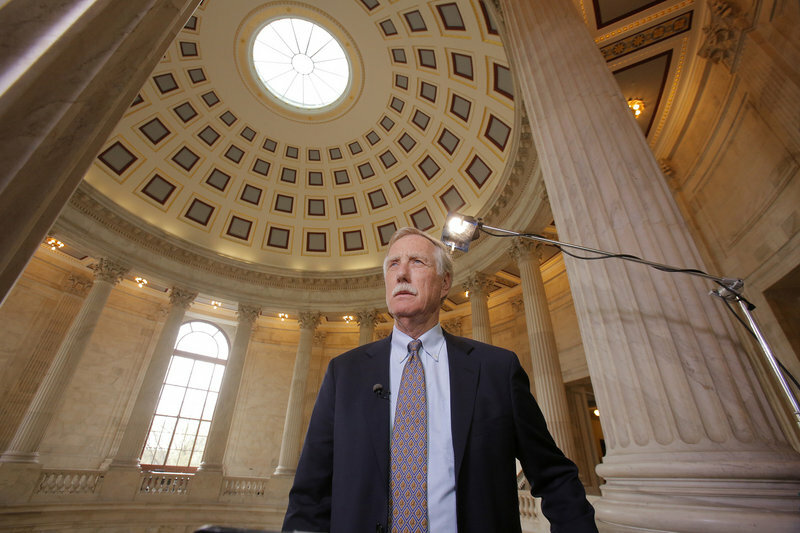 WASHINGTON – The rising sun bathed the U.S. Capitol in postcard-perfect light early Thursday morning as U.S. Sen. Angus King walked to work from his two-room apartment a few blocks away. Suddenly, he stopped dead in his tracks. 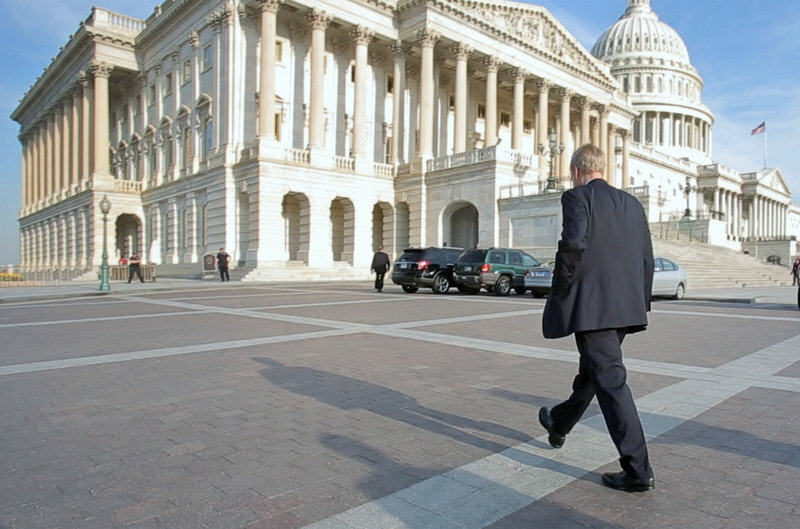 Maine’s independent senator arrives at the Capitol in Washington on Thursday. King lives about four blocks away and walks to work every morning. Nathan Little, 10, of Lewiston, who was visiting Washington with his mother, Jackie, and 8-year-old sister, Kristen, reacts Wednesday after Sen. Angus King asks him what kind of work senators do. King wrote a note for his teacher, explaining that Nathan should be excused from school since he was helping King with his work in Washington. 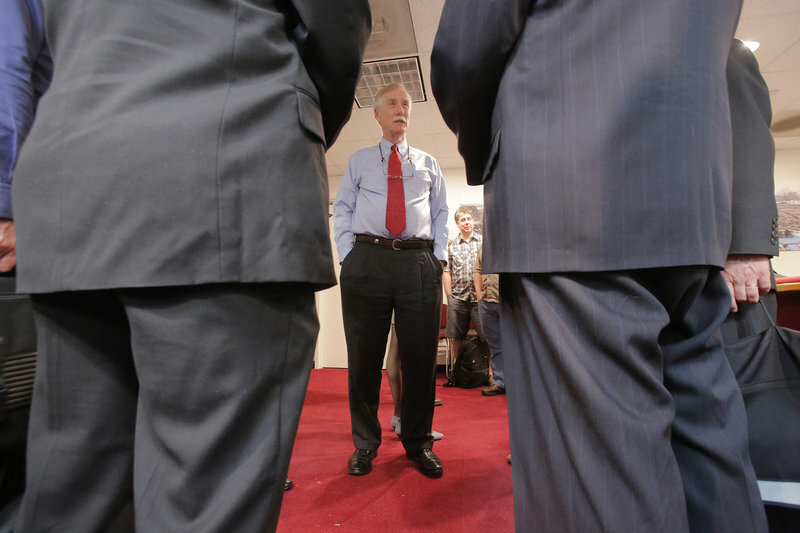 Shortly before a vote on the gun-control debate in the Senate on Thursday, Sen. Angus King speaks with some of the parents of victims from the Sandy Hook Elementary School shooting last December. 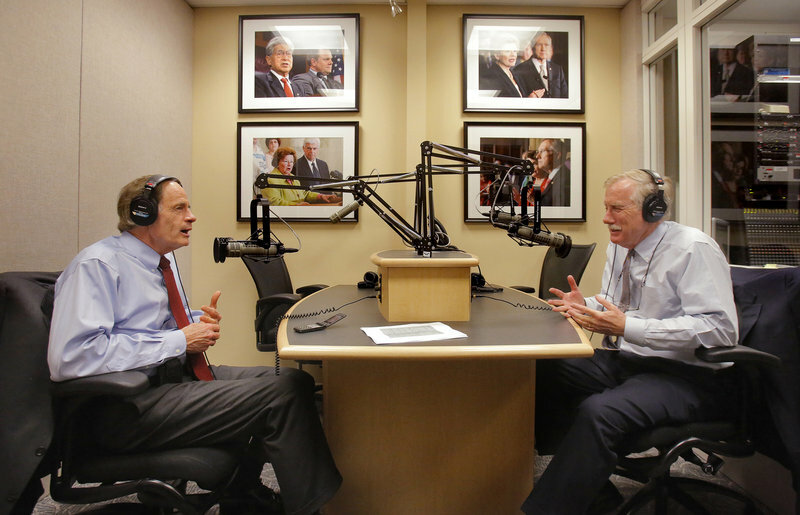 Joined by Sen. Tom Carper, D-Del., left, Sen. Angus King participates Thursday in a weekly radio program sponsored by WGAN radio. It was one of several media events that followed the Maine senator’s already lengthy workday on the Senate floor. 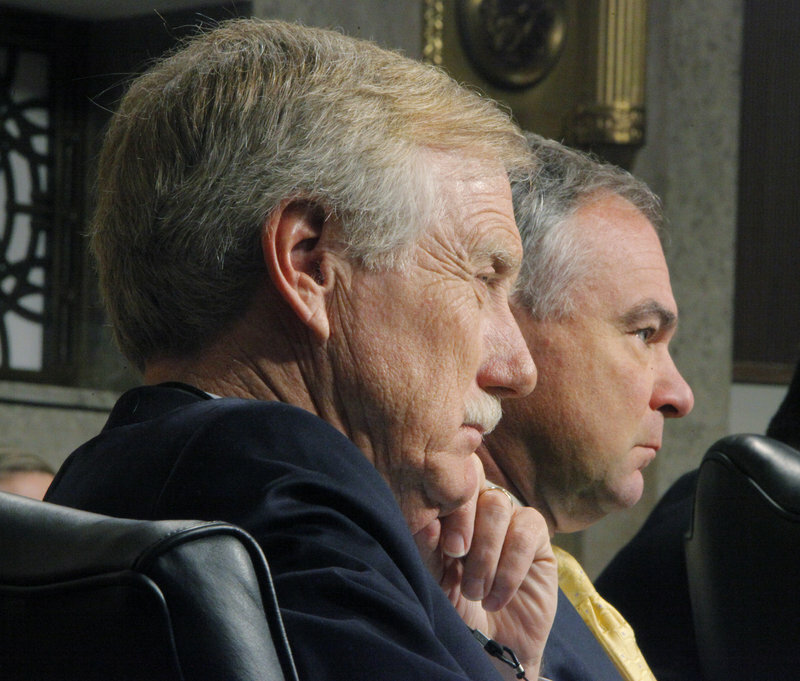 Sen. Angus King speaks with Mainers Jimmy Carrier, left, and Bob Hamer on Wednesday during Capitol Coffee with Angus, a weekly session King holds for his constituents in Washington, D.C.
Sen. Angus King addresses members of his staff in their cramped, temporary office space in a basement room of the Russell Senate Office Building in Washington on Wednesday. The group of almost two dozen aides is hoping to move into bigger quarters by midsummer. 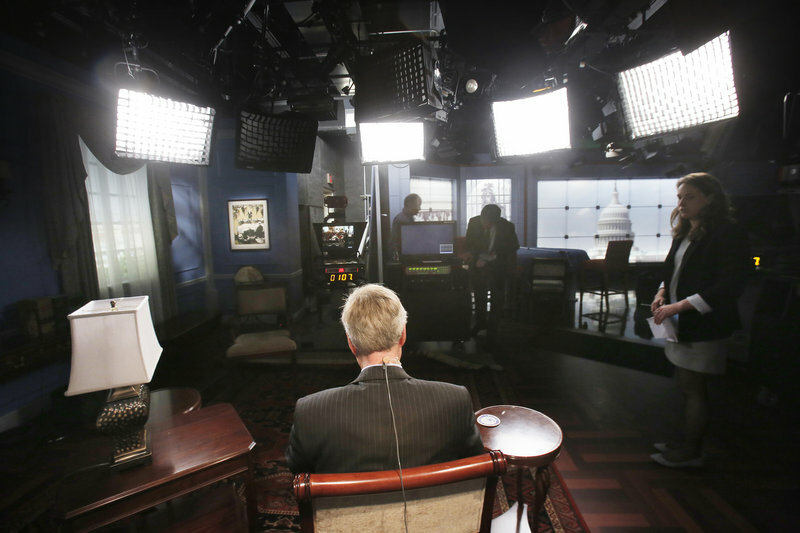 In a TV studio in the basement of the Capitol, Maine Sen. Angus King waits for the start of an online meeting with students at Bucksport High School on Wednesday. He spoke to the teens about his experiences as a senator over the past three months and answered their questions. Only a few hours later, he was in tears. Emerging from a closed-door meeting with grieving parents of children lost four months ago in the Sandy Hook Elementary School shooting massacre, King dabbed repeatedly at his eyes with a tissue, an almost helpless expression on his face as he walked across his crowded — and pin-drop silent — temporary office suite. Then, as if leading a funeral procession, he walked the parents down a long tunnel that connects Russell Senate Office Building to the Capitol. 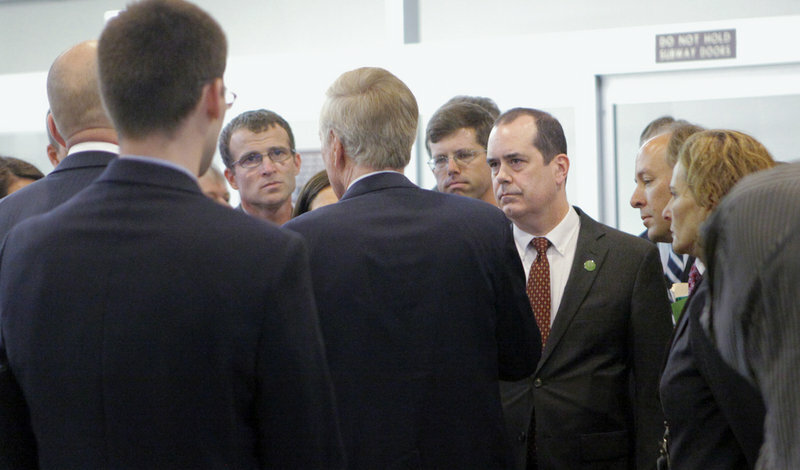 The Sandy Hook delegation continued on to the visitors gallery; King peeled off toward the Senate chamber, where he and 67 other senators overcame the threat of a filibuster and thus cleared the way to debate, at long last, a hotly contested package of federal gun-control legislation. Fourteen months ago, before Sen. Olympia Snowe shocked all of Maine — and indeed the nation — by announcing she would not seek re-election out of weariness with the partisan gridlock that has Congress in a state of near-paralysis, Maine’s former two-term, independent governor had little doubt his days as an elected leader were long behind him. Yet here he is, back in the fray in a place he last worked 40 years ago as an aide to then-U.S. Sen. William Hathaway, a Maine Democrat. Only this time, King comes with no letter denoting party affiliation affixed to his last name. A seasoned politician, to be sure, he’s at the same time a wide-eyed idealist in a place that thrives on cynicism, a man on a mission (or is it a fool’s errand?) to help fix what ails the most powerful deliberative body on the planet. Friday marked the 100th day of King’s six-year term. In that short time, if a two-day visit last week was any indication, he has fast become part new kid on the block, part policy wonk, part builder of bridges across the Great Partisan Divide, part wide-eyed admirer of the larger-than-life sculptures — starting with Maine’s first governor, William King — in the Capitol’s Statuary Hall. 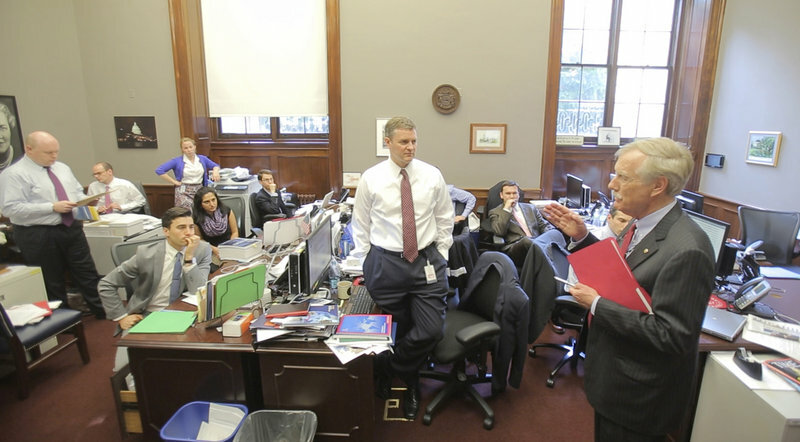 Reid, who actually produced a copy of King’s family travelogue, “Governor’s Travels,” from under a pile of papers on his desk, has good reason to sing the praises of Maine’s independent junior senator: King, much to Reid’s relief, chose in January to caucus with the Senate’s majority Democrats. Yet the positive early reviews extend across the aisle as well. Like many in the Senate’s freshman class, King has yet to be assigned a permanent office — he hopes to get one by midsummer. 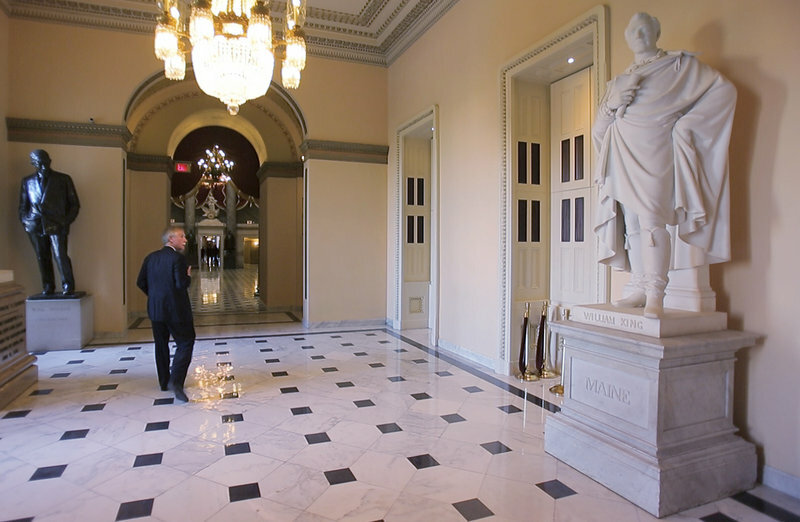 His temporary digs, just down the hall from Snowe’s old sprawling suite, consist of a small personal office flanked by an open room, no bigger than most veteran senators’ outer lobbies. There, King’s staff of close to two dozen aides — most less than half his age — sit cheek-to-jowl amid a warren of wooden desks. To the first-time visitor, the bunker-like atmosphere feels more like a campaign war room than a hall of government. So meager is his space that King must go searching each week for a conference room to accommodate his Wednesday-morning coffees with Mainers visiting the Capitol. Last week’s gathering attracted about 30 people, ranging from a Maine People’s Alliance delegation in town for an immigration-reform rally to the Little family of Lewiston — parents Todd and Jackie, Nathan, 10, and Kristen, 8 — on a weeklong tour of Washington. 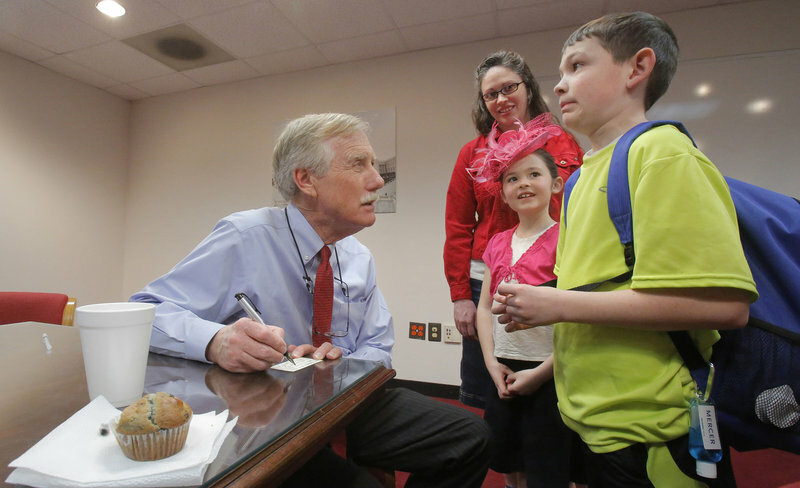 “They won’t keep you after school now,” a smiling King assured Nathan as he signed the souvenir and moved on to talk logging, immigrants’ path to citizenship and whatever other issues brought his constituents from Maine to Capitol Hill. The pace, particularly for a man who turned 69 on March 31, is frenetic — half the big business of the nation, half the many and varied concerns of the people who sent him here. In addition to budget and armed services, King sits on the Senate’s intelligence and rules committees, often ducking into an anteroom during committee sessions to meet with the endless stream of constituents seeking a moment of his time. His posture during such visits is hardly King the esteemed senator, holding court with this or that suitor for his time or influence. Rather, he seems to reach back to his days, long before he ran for anything, as the host of Maine Public Broadcasting Network’s “Maine Watch” program — a curious interviewer seeking the facts and context behind a constituent’s painstakingly prepared talking points. But if the politicking occasionally wears him out, King’s aides and fellow senators unanimously attest, it is the legislative work that has him behaving like a man 10 or more years younger. Like the 10 other current senators with previous experience as governors — he recently hosted all of them, at his own expense, to a Maine lobster dinner inside the Capitol — King often finds himself balancing the art of senatorial bonhomie with an impatience to get things done. Concerned after six weeks on the job that the Budget Committee was spending too much time dithering on when and how to draft its version of a federal budget (an accomplishment that had eluded the Senate for four years), King decided to go ahead and build one himself. Kay Rand, King’s chief of staff, worried such a step might be perceived as too bold an overstep for a newcomer like King. Yet much of King’s work, she notes, found its way into the spending plan approved last month in an all-night session by the full Senate — including $100 billion for research and development and rebuilding the nation’s infrastructure. The query hung in the air for several seconds. Finally, the Republicans said no, there was no way they’d line up behind the budget with or without their amendments. That same frustration colored King’s reaction to earlier negotiations over the Senate’s oft-used filibuster rules — his call for “talking filibusters” in which senators must actually hold the floor to prevent a vote was left out of what many considered a watered-down set of reforms. Conversely, as he waded into the hot waters of post-Sandy Hook gun legislation, King found himself roundly criticized by many gun-control advocates for not wanting to do enough: While he supports universal background checks for gun buyers, limits on high-volume magazines and outlawing “straw purchases” that put guns in the hands of convicted felons, King decided not to support calls for an assault weapons ban. He concluded, after meeting extensively with advocates on both sides, that such firearms are functionally no different than most semiautomatic hunting rifles. That said, King lay awake Wednesday night worrying how the latter position might go over with the Sandy Hook parents the next morning. “They said, ‘That’s where we are, too,’ ” King replied, exhaling hard to show his relief. The roller-coaster ride, of course, has only just begun. Exhilarating as his first 100 days have been, more than 2,000 remain before the end of his term. And beyond that, King envisions this unexpected chapter of his life lasting not one term, but in all likelihood two. “That is, if the voters of Maine still want me after six years,” he chortled. In other words, he could be doing this until he’s 80. Why he would do it is no mystery to Mainers who have watched him, and mostly supported him, all these years. For a man who wears his love of history on his sleeve and now walks among the larger-than-life murals, marble statues and other tributes to centuries gone by, there simply is no better place on Earth to report each day for work. But how King, on the cusp of 70, is doing it — the grueling 12-hour days, the relentlessly steep learning curves, the incessant relationship-building with colleagues of all political stripes (he’s already had personal visits with almost half of them) — is as hard to fathom as that magical morning light on the Capitol dome.